To kick off the new year, East London's High Roller Society is hosting their first-ever sticker making workshop, led by esteemed sticky-fingered extraordinaire, Stickee Rich, who celebrates 25 years of this hip handicraft. 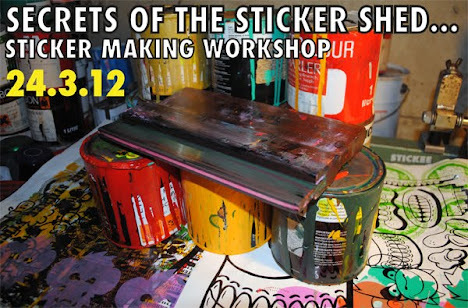 See what happens behind the closed doors of the 'Sticker Shed' with a step-by-step demo of the entire sticker making process, from creating the artwork, to making the screens, to contour-cutting a sticky masterpiece. Those attending will be encouraged to get their hands dirty with sqeegee lessons and a free-style sticker station. The Workshop begins promptly at 1.00pm with an introductory brief and demonstration. All are welcome to drop in at anytime throughout the afternoon. Also in the Gallery: New Stickers Released by tenacious favourites Mighty Mo, Rowdy, Aida, Nylon, Sweet Toof, Tek33, and Stickee. Plus: An impromptu group exhibition of assorted treats from the streets to adhere your eyes. Get stuck in! The Workshop will be Family-Friendly and Free, with a suggested donation of £2 per person. Materials and refreshments will be provided. If you missed the event the guys over at High Roller Society have updated their online gallery shop and you can now bag yourself some of the fresh sticker packs procuded at the event including Sweet Toof, Nylon, Mighty MO and TEK33. Check them out now!